During the past five years, from the ages 75 to 80, George Bouvet, MSIA, took up writing e-books. He has written nine books and hopes they will provide enjoyable reading, laughs and armchair sightseeing for all. ❊ Robert Shaw, MSIA, enjoyed the pleasure of seeing classmates Boyd Harman, MSIA, and Ted Rojahn, MSIA, this summer — as well as hosting a welcome party for incoming undergraduate CMU students and their parents in the Chicago area. Hal Shelton, BSIM, and his Amazon best-selling book The Secrets of Writing a Successful Business Plan were featured in The Washington Post. Selden Campen’s, BSIM, pictorial Guide to Chautauqua was self-published in March 2016. This 124-page historical sketch of Chautauqua Institution is presented in the form of a walking tour. Known locally as “the mix,” this institute provides its patrons with access to premier quality arts, education, recreation and religion. The launch of this book was very successful, selling over 1,100 copies — more than any other book at the Chautauqua Bookstore. Barton Norton, MSIA, is the CFO of a startup in the hydrogen storage space. Hydroline Inc. has received five U.S. and foreign patents. The company is preparing to raise $30 million to commercialize this laboratory-proven technology. Chuck Bidwell, MSIA, purchased and recreated J.W. Hulme Co. as a vibrant branded manufacturer and retailer of fine canvas and leather products through a 13-year sustained strategic plan of branding and quality. Jean Barthélemy, MSIA, is celebrating 26 years in Japan, including 14 years with JBC, the consulting firm he established in Tokyo in 2002. He is a trustee of the Institute Pasteur Japan Foundation. As a board member of Groupe Rossignol, he is involved in the upcoming 2018 Winter Olympics in Pyeongchang, South Korea. He has two grandchildren living in New Hampshire and two other children living in Paris. Kathy Englar, MSIA, is now Truckee Donner Land Trust’s new director of philanthropy, playing a lead role in the fundraising that allows the trust to deliver on its mission. Scott McGregor, MSIA, is developing a new startup in Silicon Valley — Tridimensional Innovations, which focuses on 3D scanning and 3D printing solutions for point-of-sale manufacturing. Jane Fedorowicz, Ph.D., was recently awarded the 2016 Mee Family Prize at Bentley University’s convocation ceremony. This annual award recognizes lifetime scholarly achievement that has enhanced the standing and reputation of the university. Jane is the Chester B. Slade Professor of Accounting and Information Systems at the school, located in Waltham, Massachusetts, where she has taught for over 20 years. Elizabeth Fetter, MSIA/HNZ, was appointed to Support.com’s board as a new independent director. The company is the maker of award-winning, cloud-based Nexus® software for support interaction optimization and a leading provider of technology support and turnkey support center services. Tom Franks, MSIA, and his partner, Kirk Weiss, are celebrating the 10th anniversary of their Pittsburgh-based investment management firm, Emmanuel Capital Management LLC, a Registered Investment Adviser. Robert Byrne, MSIA, has a lot of news this year. Together with his partners, he sold his company in March; his youngest started college at Washington University in St. Louis; and his oldest is in her senior year at Brown University. Dennis Leyden, Ph.D., has been appointed director of graduate studies for the Department of Economics in the Bryan School of Business and Economics at the University of North Carolina at Greensboro. The department offers a Ph.D. and a three-semester Master of Arts in applied economics. Marco DeMiroz, MSIA, and Tipatat Chennavasin, both of whom are industry veterans, started the Venture Reality Fund with $50 million to fund innovative companies across a wide variety of sectors in the emerging virtual reality, augmented reality and mixed reality landscapes. Augmented reality and mixed reality landscapes are expected to become a $120 billion market by 2020. David Barensfeld, MSIA, was recognized as the New Castle, Pennsylvania, 2016 Rotary Club Entrepreneur of the Year. He is chairman, president and CEO of the Ellwood Group Inc.
Thomas Jonozzo, MSIA, accepted a new role as VP/GM with Overhead Door Corporation in Philadelphia. Tom and Darlene relocated to Doylestown, Pennsylvania, in August 2016 and hope to connect with Tepper School and GSIA alumni in the vicinity. Lou Tierno, MSIA, is now a corporate controller at Schroeder Industries, a leader in fluid containing technology. Wendi Lau, BSIM, completed the Tantalus Triple Trek 50K at the Hawaii Nature Center in Makiki, Oahu, for the second time. The trek is a hilly, technical trail race. Wendi finished in 8 hours and 50 minutes. Ashish Malik, MSIA, was appointed as president and CEO of Bee Vectoring Technologies in Davis, California. He was formerly vice president of Global Marketing, Biologics at Bayer Crop Science in the Sacramento area. Reed McManigle, MSIA, just passed 10 years of working in CMU’s Center for Technology Transfer and Enterprise Creation. He has helped CMU create more startup companies per research dollar than any other university. In the last five years, CMU spinoffs have raised almost $1 billion in financing. Reed is always looking for seasoned entrepreneurs, advisers and investors to get involved. Contact him if you’re interested. For the first time since graduation, Suzanne Rothfield Steven, BSIM; Phil Sadow, BSIM; Jonathan Berger, DC ’13; and Susan Abrams Pollack, DC ’13, gathered together. They had a great time catching up, talking about their families and careers, and laughing about their shenanigans from the good old days at CMU! They made a solemn pact that they wouldn’t wait 23 years to get together again, complete with a group pinky promise! ❊ David Zapico, MSIA, has been elected chief executive officer and to the board of directors at AMETEK Inc. David has served at AMETEK for 26 years and is eager to bring his decisive leadership skills and experience in the field to this new leadership position. Robin Rice, MSIA, started a new role as a program manager at Magic Leap in Plantation, Florida. David Ciesinski, MSIA, is now the president and COO of Lancaster Colony Corporation located in Columbus, Ohio. He most recently served as president of the Meals Solutions Division at Kraft Foods Group Inc. His prior experience includes 15 years in the packaged foods industry, including the role of group vice president and chief marketing officer, U.S. Consumer Products with H.J. Heinz Company. Rakesh Ramde, MSIA, has joined the legal team at the business law firm Structure Law Group LLP in San Jose, California. He will bring his expertise on numerous commercial matters as an attorney at the firm. Brian August, MSIA, now leads Slalom Consulting’s Strategy and Operations practice in Portland, Oregon. His focus is with consumer products, particularly in guidance and support for supply chain and operations strategy. When not working, he can be found out on the trails or roads of Portland trying to stay in shape. Mehmet Demir, MSIA, started working as a finance director in Global Supply Chain organization of Coty Inc. as of December 2015 in Geneva, Switzerland. He is very busy with the integration of P&G’s specialty beauty business into Coty. Thomas Grimm, MSIA, is now the president of Infinity Rebuild, the exclusive rebuilder of Okuma CNC Machines, located in the Charlotte, North Carolina, area. Neil Kalvelage, MSIA, was appointed by Charlesbank Capital Partners to operating partner. Neil joined Charlesbank from Bain Capital, where he served for 10 years as operating partner. Prior to his time at Bain Capital, Neil was the senior director of portfolio strategy for the Hershey Company and a director of corporate strategy for PepsiCo. ❊ Laurie Barkman, MSIA, was happy to take this pic with Class of 1999 mates Arnold Cho, MSIA, and Sanjeev Swarup, MSIA, at “Doc’s” [now Mario’s East Side Saloon] in Shadyside. On the career front, Laurie was appointed managing partner of Topanga Partners. Laurie is excited to work with entrepreneurial leaders to build great companies. She serves on the Tepper School’s Alumni Board as past president and loves it when Tepper School classmates reach out to connect. Paula Grendys, MSIA, has joined IQ Inc. as the business development manager. Paula is dedicated to providing expert consulting, project management and software development services to businesses big and small. The team of highly skilled engineers, testers, technical writers and designers is ready to take on new challenges. They bring their drive and experience to software projects of all shapes and sizes. Shardul Mehta, MSIA, joined the United States Digital Service as a digital services expert and senior product leader at the Defense Digital Service of the Department of Defense. Previously, he led product management for U.S. Card Digital Customer Experience at Capital One. He founded ProductCamp DC and grew it to be the largest network for product professionals in the Mid-Atlantic. He is working on his third startup, providing online training programs to more than 2 million product innovators around the globe. Raji Sankar, MSIA, CEO of Wholesome International, is increasing expansion of their Choolaah Indian BBQ, adding restaurants in East Liberty as well as in the Virginia beltway area. After almost six years, Auseh Britt, MBA, left Bloomberg BNA and joined Questex LLC, a Washington, D.C., area media company operating in a variety of verticals ranging from travel, beauty and wellness to biotech and telecommunications, as their VP of Marketing & Client Services. Auseh is married to Doug Britt, MSIA ’96, and lives in Great Falls, Virginia, with their family. Nobuhiro Seki, MBA, launched FabFoundry in New York City in 2015. FabFoundry hosted the first boot camp program for hardware startups. They selected two startups (The Crated and FlexTraPower/BonBouton) and sent them to their Partner Makers Boot Camp in Kyoto, Japan. They will have the boot camp program twice a year — summer and winter — and take up to five startups for each cohort. Daniel Benitez, MBA, is now a global director for the TOC business unit at Hach (Danaher Corporation). Rocio Echeverria, MBA, was promoted to vice president (engineering and marketing) from global business unit director (residential and specialty industry) within Xylem (formerly ITT) in the greater Boston area. D. Raja, MBA, Chief Executive Officer and Chairman of the Board of Computer Enterprises Inc., spoke during Waynesburg University’s 2016 commencement ceremony and received an honorary Doctor of Humane Letters degree. A leader in the entrepreneurship field in Pittsburgh, he also hosts a business and finance focused radio show, “The Raja Show,” on KDKA. ❊ Ayse Elif Tutek, MBA, was promoted to vice president, Corporate Strategy & Development this summer at TIAA Global Asset Management. Her husband, ❊ Cristo Paraskevas, MBA, rejoined DLC as a consultant and is currently working on a project at Beam Suntory. They live in the Chicago area along with their two boys, Leonidas (age 9) and Arda (age 6). After 12 years at Bank of America in Charlotte, North Carolina, Vladimir Andral, MBA, moved to Seattle in March 2016 to join Amazon Web Services as a senior product manager. 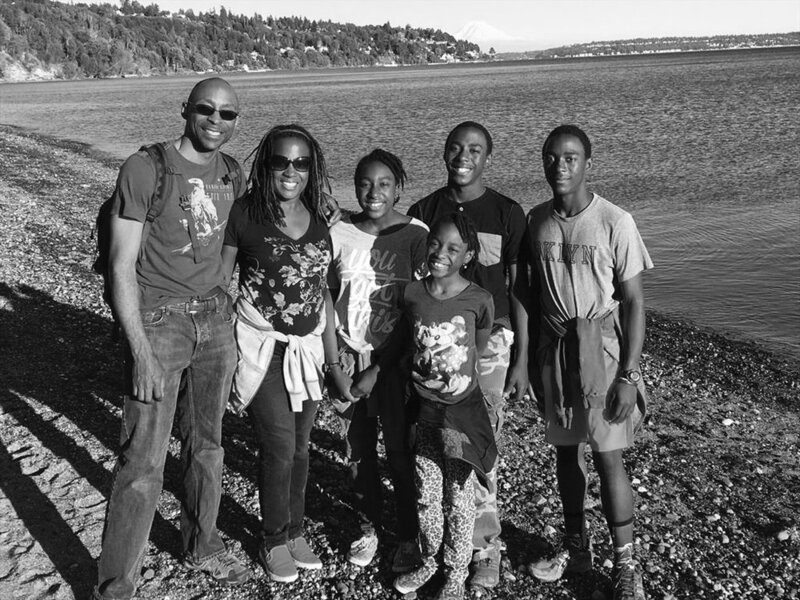 He, his wife and their four children are enjoying the Pacific Northwest and embracing all the challenges that come with such a big move. Life is short, live it up! Meg (Rothey) Berol, BSBA, was recently hired as a senior technical project manager at Groupon Inc. in the Palo Alto, California, office. She will focus on managing engineering-related projects with cross-functional teams throughout the organization. After two years at IBM Cloud, Mike Bouteneff, MBA, was promoted to a new role of global marketing manager for IBM iX, the leading digital consulting practice at IBM Global Business Services. Dave Brotherton, MBA, joined IBM as chief data scientist at IBM’s North American Analytics Center (MAAC) in Dublin, Ohio. His responsibilities include leading descriptive and predictive modeling engagements as part of the NAAC’s cross-industry center of excellence and managing half the center’s data scientists, new consultants and interns. Ken Gavrity, MBA, is now the executive vice president and group head of KeyBank’s Enterprise Commercial Payments Group. Based in Cleveland, he will oversee the bank’s domestic and international payment and trade service offerings. Tiago Moreira da Silva, MBA, DC ’97, is now a CMO at BA Vidro in Porto, Portugal. BA Vidro is a leader in glass packaging for the food and beverage industries. Kevin Bethune, MBA, is now the vice president of strategic design at BCG Digital Ventures, which was founded in 2014 in Manhattan Beach, California. Lourdes Garcia-Calderon, HNZ ’06, BSBA, and her husband, Brian Quinn, welcomed their baby girl, Gemma Carmen Quinn, on July 13, 2016. They live in Oakton, Virginia. Derek Underwood, MBA/E, was married in September 2015 to Britt Ehrhardt. They had an excellent time hiking in the Andes for their honeymoon. Derek has been working since November to help build a new company called Q Bio Inc. This new venture hopes to shift health care into a new paradigm by empowering patients and their physicians to quantify, track and analyze physiological changes in their bodies. Vasudev Venkatesan, MBA, is now a senior director (service marketing) at Veeco in Freemont, California. Jordan Esten, BSBA, was recently named chief operating officer at Clear Ballot Group. Located in Boston, the software company is modernizing elections with transparent and accessible software to improve the experience for election officials, voters and candidates. After a seven-year career at Barclays, Vikash Gupta, MBA, launched a new asset management and investment banking firm called VaR Capital. Vikash hosted a Tepper School alumni reception at his offices in September with Dean Dammon. Shamir Karkal, MBA, manages the development of open APIs at BBVA as a head. Susan Koger, BSBA, and Eric Koger, MBA ’07, BSBA, co-founded ModCloth in 2002. After operating as an online site for women’s indie apparel, ModCloth will be adding brick-and-mortar stores to its existing click-based business model. Susan spoke at CMU as part of the Swartz Entrepreneurial Leadership Series in September as part of a visit to Pittsburgh. Tim Spang, MBA, joined Seegrid as the vice president of operations. As a senior executive with extensive experience in international business, operations and product development, Tim will play an integral role in expanding Seegrid’s manufacturing capacity and guiding company strategy. Gautam Anand, MBA, is now the executive vice president, head of HR for India and South Asia Consumer Business at Airtel. Yuri Goryunov, MBA, moved from PricewaterhouseCoopers to McKinsey to become an associate principal based in the Chicago office. ❊ Jill (Yellock) Haugabrook, MBA, married her husband, Kevin, on July 9, 2016. They now live in Decatur, Georgia. Jill Serves on the Tepper School Alumni Board and is looking forward to celebrating her 10-year class reunion in April. Victoria Lui, BSBA, married Scott Wang. ❊ Christopher Ruscitti, MBA, and his wife, Catherine Schilken, are excited to announce the birth of their son, Greyson, on April 9, 2016. Their daughter, Haven, is thrilled to be a big sister! Maciej Golonka, MBA, is now a head of customer engagement and marketing automation at Amazon. Siva Kasaraneni, MBA, moved as a director at PricewaterhouseCoopers to strategy and program development director at Anthem. Bernd Kullmann, MBA, is now a director of supply chain operations at Medivation. Bernd is responsible for planning, label/packaging development, label and pack, distribution, and process improvement functions. To do so, he leads the strategic planning to establish the launch and commercial supply network. Guy Levit, MBA, was promoted at Yahoo and is now a senior director of product management, for which he leads Yahoo’s search advertising team as well as the advertising interfaces of Yahoo Gemini. Brian Patterson, MBA, changed from being a lieutenant commander (naval officer) in the U.S. Navy Reserve to being an operational director (for North and Middle America) at DSM Coating Resins. Jagriti Hooda, MBA, is now a director for customer success management at CEB. Shouhua Nie, MSCF, changed from his Latam fixed income trader position at BNP Paribas to be a portfolio manager at First Seafront Fund. ❊ Meredith Grelli, MBA, co-founder of Wigle Whiskey, is a 2016 BusinessWomen First winner. She is also seeking to create an interactive whiskey museum in Pittsburgh as well as organizing the Three Day Blow festival in order to draw attention and capitalize off Pittsburgh’s growing food and drink revolution. Lloyd Jackson, MBA, is now the director of corporate finance and strategic planning at NiSource. Avinash Kalyanaraman, MBA, was promoted from managing strategy consultant to senior manager analytics within IBM Corporation. Hiroyuki Kawada, MBA, is now a senior event marketing manager at Gartner. Steven Novick, MBA, CS ’09, is now a senior program manager for the Office 365 Foundations team working on global datacenter expansion plans for Office 365. He just wrapped up opening datacenters in Canada and is working on new and exciting locations. Martin Proskin, MBA, is now a divisional operations manager at Li & Fung Ltd., where he leads a global operations team with members in Hong Kong, Shenzen, Shanghai and Istanbul. Among her many roles serving as leader in community revitalization in Detroit, Brittany Sanders, MBA, is now a mathematics tutor for Downtown Boxing Gym Youth Program. Christian Witt, MBA, helped the CEO of Okta develop the company’s business plan. Nicoleta Diaconu Schroeder, MBA, is a general manager of Uber in Romania. According to Nicoleta, Uber would like to launch and expand into Cluj, Timisoara and Iasi this year; the company uses technology to determine potential demand in these new cities. Se Yun Kim, MBA, is now a general manager for the future strategy office at Hyungji Group. Alon Wertheimer, MBA, is now the head of growth at Skyfit. Stephen Cho, MBA, is now an associate brand manager at Unilever. Rohini Gupta, MBA, changed from being an associate brand manager at Campbell Soup Company to being an assistant brand manager at Ghirardelli Chocolate Company, where she is responsible for the company’s retail business. Jonathan Matusky, MBA, E ’11, is a program manager for Innovadores Foundation, where he runs the Havana-based portion of the intern exchange program, which annually brings Cuban students to the United States for a six-week program focused on STEAM (science, technology, engineering, art and math). Rose Yu, MSCF, is now an associate at BlackRock. Paul Filenko, MBA, is now a principal marketing consultant at CSLD Solutions. The company strives to help clients grow revenue, reduce operational cost and achieve higher customer standards by identifying the drivers that will have the most significant impact on increasing customer success and loyalty. Enrique Garza, MBA, was promoted from business innovation lead to mid-market and online sales engineering lead within Google. James Julius, MBA, launched Visimo, a data analytics and strategy consultancy, in Pittsburgh, with business partner and former Heinz executive Michael Hasco. Craig Saldanha, MBA, is now the senior manager of product management at Amazon.com. Yajnika Sharma, MBA, got promoted from senior financial analyst to finance manager at Amazon. Emily Smith, MBA, is now a senior compensation analyst at McKesson, where she specializes in long-term incentives and executive compensation. Reema Thawrani, BSBA, is now a strategic project manager at Fetchr in Dubai. Nathan Timm, MBA, is now a human capital consultant at Deloitte. Madhumitha Venkataraman, MBA, is starting her Ph.D. at Duke University and moving to Durham, North Carolina, with her husband, Naveen Sukumar, MBA ’12, and dog (Alfie, Honorary MBA — Master of Being Adorable 2015). Madhu chose the road less traveled by pursuing a doctoral degree after the MBA, and she now looks forward to a career in academia. Daniel Wiesenfeld, MBA, is now the director of advanced analytics at L.E.K. Consulting. Jing Bao, MBA, is now working for Conde Nast China as a head of digital initiatives; she spearheads emerging digital strategic projects and promotes the digitalization of the company’s business. Mrugank Desai, MBA, is now a manager at Deloitte in the Chicago office. Ryan Fandetti, MBA, moved from being a senior associate for financial services at PricewaterhouseCoopers to being a management consultant for business consulting at Fidelity Investments. Jordan Jhabvala, MBA, is now a senior manager of client experience at Charles Schwab. David Lustig, MBA, is a strategic account manager for Americas manufacturing, logistics and hi-tech at Infosys. He is based in Charlotte, North Carolina. Todd Medema, BS, co-founded Unmanned Response, a drone service company that saves time, money and lives for infrastructure inspection, public safety, filmmaking and commercials, real estate, and more. Sakshi Mehta, MBA, was promoted to senior manager of strategy and planning within Thomson Reuters. Juan Serrano, MSCF, is now an equity derivatives trader at Deutsche Bank. Nyeonki Shin, MBA, is now a senior portfolio manager at Midas International Asset Management Ltd.
Kathleen Wallach, MBA, is now a director of research and analytics at Inveniam Capital. Kai Wei, MBA, is now a competitive insights manager at GoPro. Jeremy Gottlich, MBA, is now a senior consultant at Ignyte Group. Vishal Sandhu, MBA, is now a graphics product marketing engineer at the Intel Corporation. Samantha Grant, MBA/HNZ, was listed among the 100 Best and Brightest MBAs in the world from the Class of 2016 by Poets & Quants. She is in the HR Leadership Program with GE Healthcare in the Greater Milwaukee, Wisconsin area. Ankit Mathur, MBA, is now a senior associate at PricewaterhouseCoopers. Rashna Patel, MBA, is now a senior consultant at Deloitte Consulting. Trishika Pattabiraman, MBA, is now a senior vendor manager at Amazon. Kartikay Sahay, MBA, is now product manager at Walmart Global eCommerce. Shrivathsan Sridharan, MBA, is now an infrastructure analyst at Tata Consultancy Services. George Steiner, MBA, is now an associate product manager at Snaps.